It’s no secret that Italy is home to a plethora of beautiful towns and villages; whether it’s the cobbled streets or the rolling hills that they’re nestled on, there are a number of reasons why Italy has some of the prettiest locations around – Ostuni is no exception. Hidden in the heart of Puglia, the city is renowned for its white-washed town, where the flat top buildings contrast against the tranquil teal waters. From the buildings that rise from the flat plains, you wouldn’t be mistaken for thinking that you’re currently wandering around a Greek village! Find out more about how the wonderful city of Ostuni is the perfect place for your next Italian getaway! Ostuni has a rich and vast history dating back over 50,000 years ago. During the Palaeolithic period, it is believed that Neanderthal hunters lived in the area, taking refuge in the caves that can be found in the area. In more recent years, fossil discoveries have backed up these claims, with the body of a 20 year old woman who is believed to have lived 25,000 years ago found. Today, you can visit her skeleton in Ostuni’s historic centre. 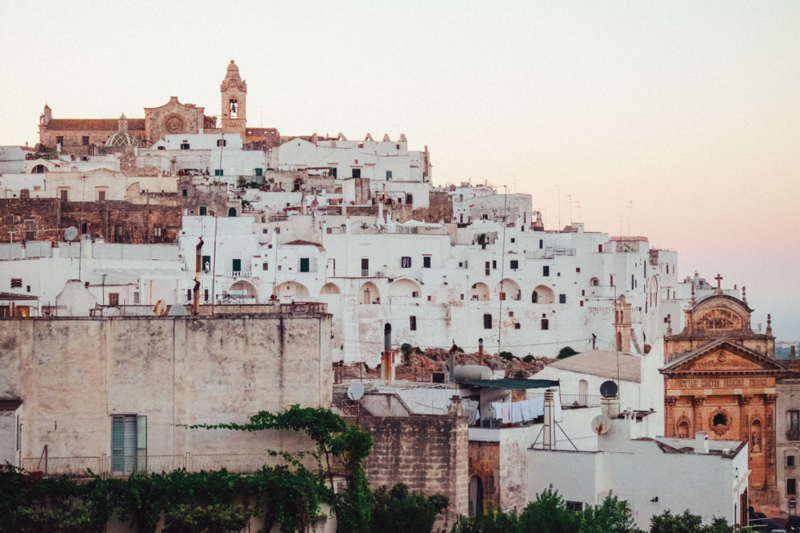 Over the course of the winter, Ostuni is home to approximately 32,000 residents. However, as the warmer months begin and the sun starts to shine, this number can be expected to increase to as many as 100,000 people! Translating to The White City, Ostuni is home to a white-washed town which sits on a fortified hill. Due to the nature of the town and its appearance, Ostuni has a Greek charm thanks to its buildings and its winding streets which allow you to navigate your way to the top of the hill. Aside from the plain exteriors, many of the window frames have been decorated in bright colours, the perfect contrast to the otherwise blank canvas. One of the reasons that Ostuni is set apart from other towns in Puglia is the shape of its buildings; unlike the traditional cone-shaped Trulli, houses in Ostuni are flat roofed, giving the settlement a slightly different appearance to what you may expect. The elaborate Gothic architecture of Ostuni’s cathedral make it a must-see location for any art fans who visit the city! The imposing building showcases the best of the late Gothic period and, although it dates back to the 15th century, it has been carefully restored to show the intricate designs in all of their glory. For those of you who are travelling to Puglia for the first time, you may not be acquainted with the afternoon pausa, in which restaurants and shops close their doors for several hours in the afternoon before reopening in the evening. This can sometimes cause difficulties, especially if you’re unaware and travelling with children. So, to avoid being left hungry, make sure that you head out early to make the most of the morning! Built by the Messapi, defensive walls were created in order to prevent access from rivals. These were then used several times throughout the years by different settlers, including the Byzantines, the Normans and the Aragonese, the latter who needed to reinforce the walls after an earthquake in 1456. From the 24th to the 27th of August, there is a celebration held throughout the city in honour of their patron saint, Orontius of Lecce. Cavalcata di Sant’Oronzo is held annually in remembrance of the saint being saved from the plague which once wiped through the land. Orontius of Lecce ordered the houses of those who had caught the plague to whitewash the front of their homes with limestone, which is the reason for the appearance of the town today. The event includes a costumed procession through the town which is held on horse back in addition to music, dancing and eating! For more information as to how you could soon be gazing upon the breathtaking, white-washed walls of Ostuni, contact a member of our team today. Whether you’re planning on visiting Puglia with children, or staying in one of our incredible villas in Puglia with a pool, our team will strive to ensure that you have the best time possible while away. For more information about why Puglia should be top of your travel bucket list, take a look at our blog, where we have a bank of information about what you can expect from the region. Additionally, lust over the beautiful scenic sunsets that you can see while away by popping over to our Instagram, which can be found here!